While free agent quarterback Colin Kaepernick is still without an NFL home for his protest against the killing by police of unarmed African-American men, women and children, he still has at least one NFL supporter. Philadelphia Eagles safety Malcolm Jenkins, who’s been a champion of Kaepernick’s protest since the beginning, continued his silent protest of raising his fist during the national anthem before the Eagles’ preseason game against the Green Bay Packers. 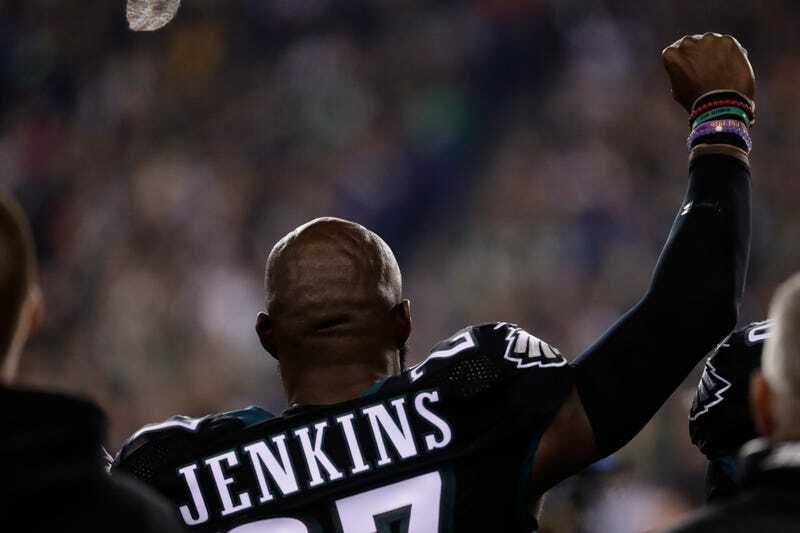 Jenkins has been one of the most vocal and visible players supporting Kaepernick’s kneeling protest, which began last year. Jenkins not only began showing his support of Kaepernick’s protest but also hailed the move as “genius” and called owners who refused to sign Kepernick cowards. Last season, I raised my fist as a sign of solidarity to support people, especially people of color, who were and are still unjustly losing their lives at the hands of officers with little to no consequence. After spending time with police officers on ride-alongs, meeting with politicians on the state and federal level and grass roots organizations fighting for human rights, it’s clear that our criminal justice system is still crippling communities of color through mass incarceration. With the new call for a war on crime and drugs, the disproportionate oppression of poor communities and communities of color will continue unless legislative efforts and community engagement are made a priority. I’ve seen signs of life with regards to bipartisan support for criminal justice reform, but the support does not reflect the necessary urgency for real reform. This must be made a priority. Many have argued that while fans have noted that they will protest the NFL this season, the true impact will only be felt by the league if players band together to make a statement. At least one player is courageous enough to raise his fist to power.